Indian movie Quick Gun Murugan is being released today, on August 28 in English, Hindi, Tamil and Telugu. Dr Rajendra Prasad (Telugu film actor) the hero as ‘Quick Gun Murugun’ fights for promoting vegetarian food while Nassar, the villain as ‘Rice Plate Reddy’ fights to promote non-vegetarian food. Dr Rajendra Prasad, to popularize the movie and to create public awareness on vegetarian food, prepared a dosa measuring 32 feet and 5 inches long. Prepared with a team of 16 chefs and eight helpers. Team practised for 10 days to give a perfect finish. Took less than 40 minutes to prepare. Prepared at Sankalp Restaurant in Ahmedabad on August 19. In March 1997, received a ‘Certificate of Commemoration’ from the Guinness World Records for making a 25 feet long dosa, the largest in the world. In February 2006, they broke their own record by making 30 feet long dosa. Now Sankalp Restaurant has broken their own record by making a 32 feet and 5 inches long dosa. 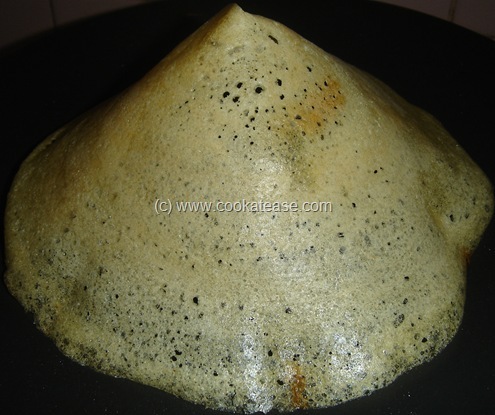 View amazing photographs of 32 feet 5 inches long dosa, from Desi Colours. It is high time for restaurants to make, tallest cone dosa. Read more from, The Times of India.